Four young would-be “Brides in White” arrested by Syrian President Bashar al-Assad’s security agents in a Damascus souk midday Wednesday remain incommunicado in locked interrogation rooms. 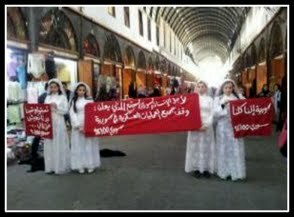 Security men wearing the uniform of black leather jackets rounded up the four young eligible females as they paraded in typical white bridal gowns in Souk Midhat Pasha with three banners calling for peace. There were no would-be grooms in sight at the time of the arrest of the four bachelorettes. They are Kanda Zaour, Lubna Zaour, Ru’a Jaafar and Rima Dali. Syrian author and human rights activist Mays Kreydee, who now lives in exile after being banned from writing in September 2011 and arrested and released in May 2012, went on air last night to express her concern about the fate of the four young girls. The governor of Damascus Midhat Pasha founded Souk Midhat Pasha (also the Long Souk), where the “Brides in White” were manhandled and picked up, in 1878. The souk stands above the Roman "Street Called Straight" that used to traverse the city from Bab al-Jabieh to Bab al-Sharqi, and runs parallel to Souk al-Hamidiyeh, with numerous side-souks separating them. On both sides of the souk the shops are filled with local textiles, silk cloth, woolen cloaks, headbands and skull caps; there are also ancient khans (inns) whose entrances and archways house an endless number of other smaller shops.